Let me tell you about a somewhat one sided love story between an Australian writer and an interplanetary Flagship-class unmanned spacecraft. I’ve written before about the way that the Cosmos series was pivotal for me and loomed large in the relationship between my father and I, how it became tangled up in my grief when he passed away in 1987, and how it ended up with Voyager-themed ink being permanently applied to my left arm. See, by the time Cosmos was being made the Voyager spacecraft were only half way through their grand tour of the four giant planets of our solar system: they’d taken the first close up shots of Jupiter and then of Saturn, with Uranus and Neptune to come. And those pictures of Saturn were mesmerising. Aside from being scientifically fascinating and the mission a triumph of human ingenuity, Saturn’s also just stunningly beautiful. 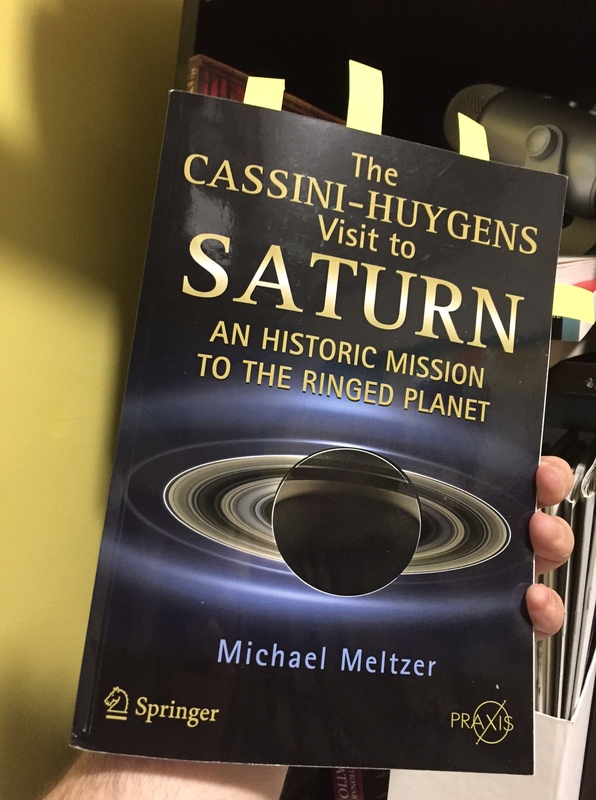 But one spinoff was that it whet my interest in space probes more generally, and due partially because of the Saturn connection and mostly because it was a few months after the tenth anniversary of my father having lost his battle with leukemia, I poured a lot of grief-energy into learning about the Cassini-Huygens mission that was taking humanity back to Saturn. It would take four years for Cassini to get from Earth to the ringed planet. Once there it would drop the Huygens lander on Titan (which was in itself astonishing: the one and only lander humans have successfully deployed beyond Mars) and then dedicate itself to sweeping through the Saturnian system to, among other things, take a whole bunch of photos. And god, how I wished that my father would be there to see them, which was to be something of a theme for the next few decades. 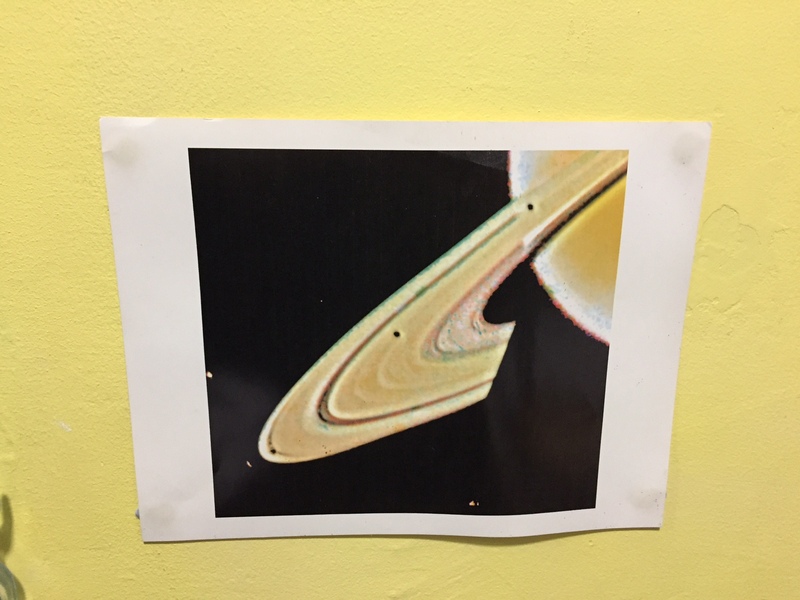 A very well-loved Voyager shot of Saturn, complete with blutack stains. I logged every infrequent update in those early-internet times, wept at the gorgeous Van Gogh swirls of the Jupiter in the photographs it shot in 2000 during its slingshot path out of to Saturn, and rejoiced with completely indefensible joy when Cassini successfully carried out the Huygens landing and began taking the first close up pictures of Saturn’s moons and rings. And it just didn’t stop: Cassini would finish one phase of its mission, still be completely operational, and then have its mission extended: when it got to the end of the Prime Mission in 2008, it was extended for another two years. And then another seven. And during that period it was discovering more and more things about the marvellously dynamic Saturnian system (including seven new moons! ), and thereby giving insights into how the solar system – and by extension we – might have formed out of the gas and dust surrounding the Sun five billion years ago. And I very much appreciated the fact that when it took the heart-burstingly beautiful photograph of Earth through the rings – known as “the day the Earth smiled” – it just so happened to be my 41st birthday. You know, just in case I wasn’t already emotionally invested enough in this damn mission. And this September Cassini ends almost 20 year odyssey by plunging into the atmosphere of Saturn to be vaporized, lest it collide with one of Saturn’s moons that might potentially harbour some form of life and really not need any Earthly contamination. And because of the way that the Earth is aligned, the mighty dish at the Canberra Deep Space Communication Complex will be picking up the final radio signals it ever sends*. In other words, this mission I’ve been following since the beginning officially ends within driving distance of where I’m living. So: it would mean a ridiculous amount to me to be there at the end to say goodbye to a friend that’s brought me so much joy and fascination for so very, very long. And if you want to see me get overly emotional on Twitter live from the CDSCC, then here’s hoping I convince the good people there that I should be one of the invitees to cover the #GrandFinale live. And this is my case for inclusion. *Well, technically that final radio signal will arrive about one hour and ten minutes after Cassini’s been silenced, since Saturn will be about 8.5 AU away from Earth at the time. But you know what I mean.